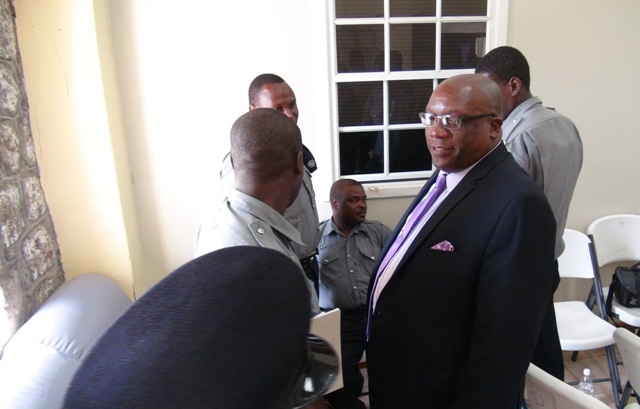 NIA CHARLESTOWN NEVIS (OCTOBER 15, 2015) — Premier of Nevis and Minister of Security Hon. Vance Amory, told Police Officers in the Royal St. Christopher and Nevis Police Force, Nevis Division that the Nevis Island Administration (NIA) would seek to address their concerns to ensure that their sacrificial job of policing is accommodated, well respected and appreciated. Mr. Amory’s comment came when he delivered brief remarks at the start of Prime Minister of St. Kitts and Nevis and Minister of National Security Dr. the Hon. 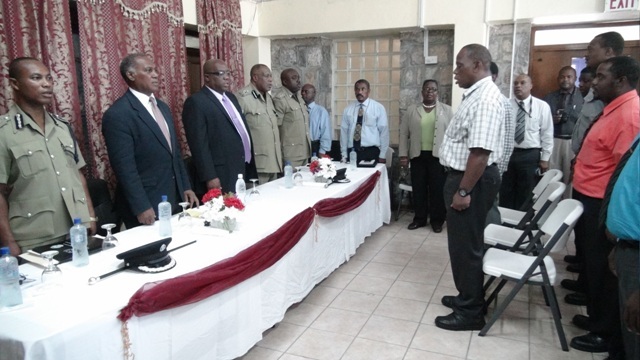 Timothy Harris’ first meeting with officers stationed on Nevis. The meeting was held at the Charlestown Police Station on October 14, 2015. He said the NIA and the Federal Government had the highest regard for the work of all police officers in St. Kitts and Nevis. Mr. Amory also stated, that the Prime Minister and the Team Unity Government appreciates the challenges that the officers face as keepers of the peace who are sworn to uphold the law and protect the citizenry of St. Kitts and Nevis. Meantime, in his remarks Dr. Harris urged officers to strive for excellence no matter the circumstances. “I am hoping that your exposure would equip you well to, as it were, exercise your duties, accept your responsibilities and perform always excellently in good times and bad. That is the nature of life. You are going to find challenging occasions in which you have to perform and you are going to find those non-challenging occasions in which also you have to perform. “The performance you must always aim for is one of excellence and there are going to be from time to time resource shortages. Those should never stop you from striving to do excellent work,” he said. The Prime Minister used the opportunity to thank all officers enlisted in the Armed Forces in the Federation. He acknowledged they are serving in challenging times but still expected them to serve and protect all the people of St. Kitts and Nevis. 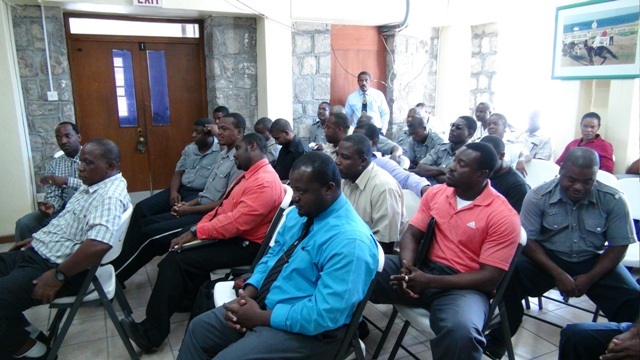 Dr. Harris told the Officers, that the government expected good work from them and as the Division was made up of youthful persons, energy and vitality should be demonstrated in their efforts at fighting to maintain law and order and creating a wholesome and peaceful society. He said the business and religious communities are expecting excellent work from the police. Also people in their homes and in their communities wanted to feel the presence of the Officers, as well as count on them to serve and protect. The Prime Minister, reiterated the Team Unity Administration’s position that it will provide all the necessary support and resources that the State can reasonably provide in the fight for justice to ensure that the criminal justice system is functioning in a good way. “I have said that the police is free to do their work. I see my role largely as a resource mobiliser assisting in ensuring that there are no excuses for non-performance,” he said.